So today we had planned the usually annual Phipps family outing to the Dallas Auto Show. We knew Benji would be impressed with it this year as he loves his cars. So we made the plan earlier in the week to eat at our usual Auto Show restaurant, Herrera’s. Grandpoo and Oma would be joining us on this adventure so we arranged to meet at the restaurant for an early dinner before hand. Grandpoo always like to rush out the door and he assured me there was no way I would make it by 5:15 if we left at 4:30. We ended up leaving late at 4:45 and still pulled in right on time. We piled the kids out of the car and sat down with Oma and Grandpoo who had been waiting for about 15 minutes. After a quick return to the car to fetch Grace’s purse which she claims to have told me to grab, we got down to ordering. 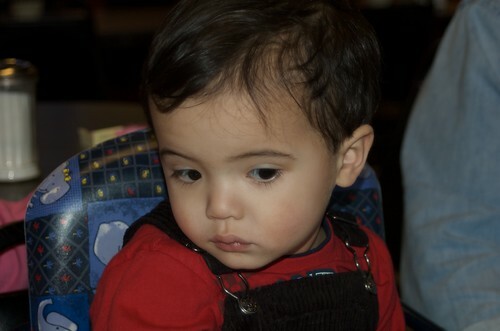 Benji had passed out on the way and just woke up as we got seated. He was still in a daze. They came out with some chips and salsa for our side of the table. I ordered some queso for the wife and kids as I would be the only one eating the salsa. Grace thinks the salsa is WAYYY to hot. Grandpoo and I think it’s great. Luckily for them the queso arrived quickly. We also ordered some tortillas to munch on while we waited. 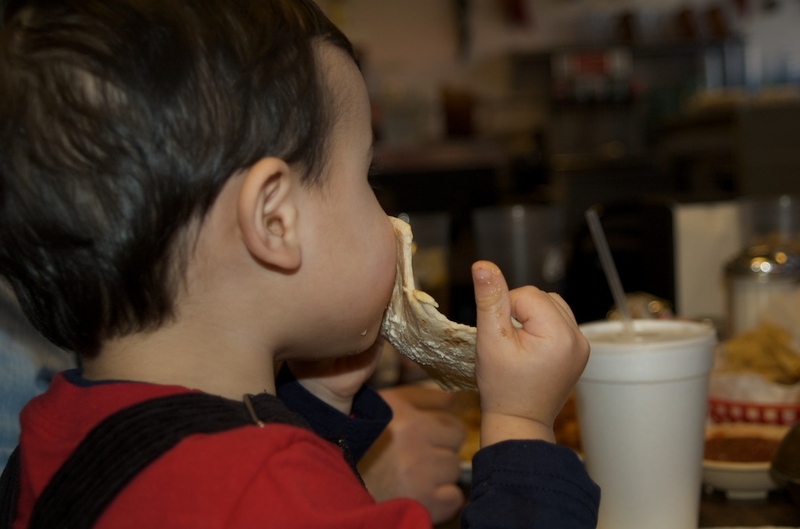 Benji wanted butter on his tortilla after he saw Grandpoo doing it. We know of Benji’s bad butter habits so Grace refused him. Benji managed to convince Grandpoo to give him some since that’s how Grandpoo loves his. 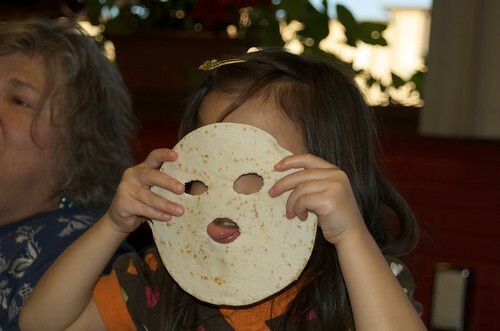 Mina decided it was time to entertain Benji with some tortilla faces. Once the food arrived everyone ate pretty quickly, even Mina. 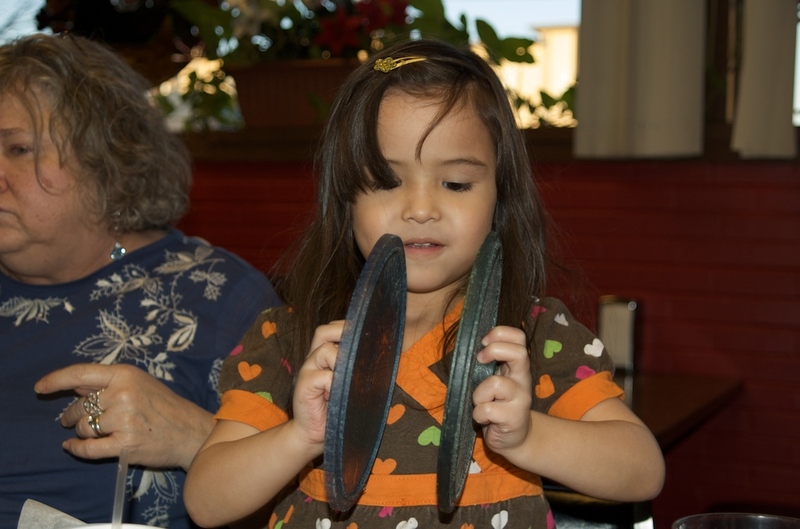 I decided we needed a few more tortillas and once we got the second tortilla warmer, Mina discovered the lids looked like cymbals. She decided to play them. 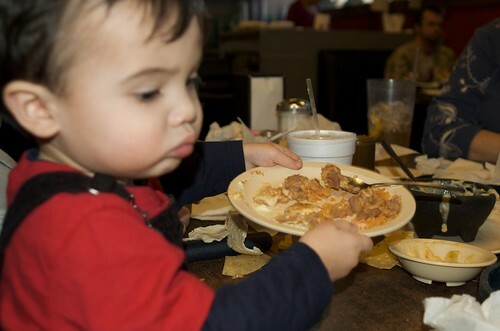 Benji decided he was done and handed his plate over to the waitress. Everyone else was about done as well so we wrapped things up to get to the auto show. 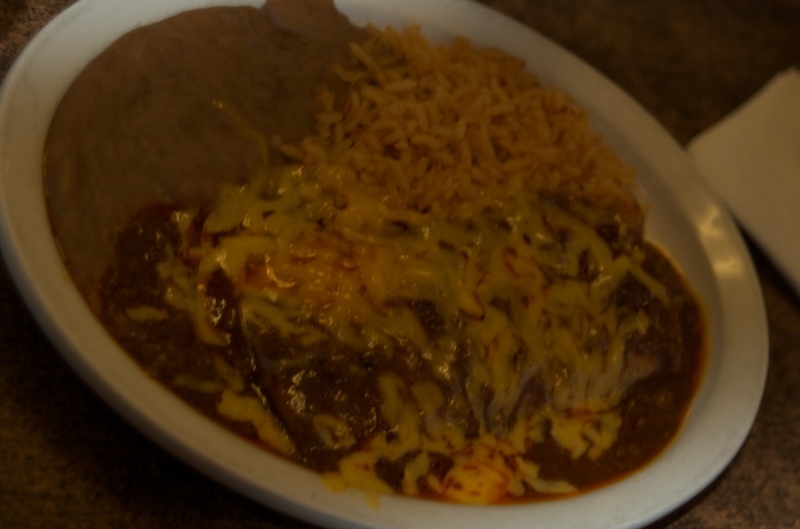 Herrera’s is outstanding traditional Tex-Mex. 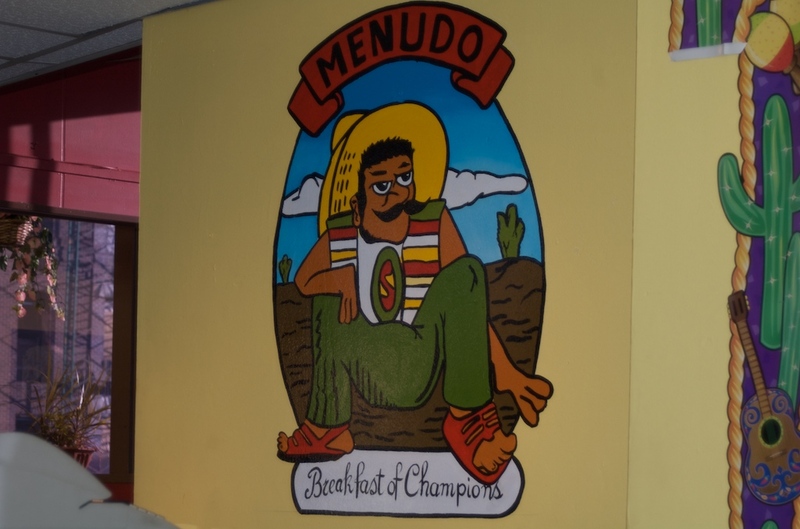 Its got all your favorites done really well plus some outrageously hot salsa which is a big plus in my book. The beans and rice are great and you can’t skip on the tortillas. 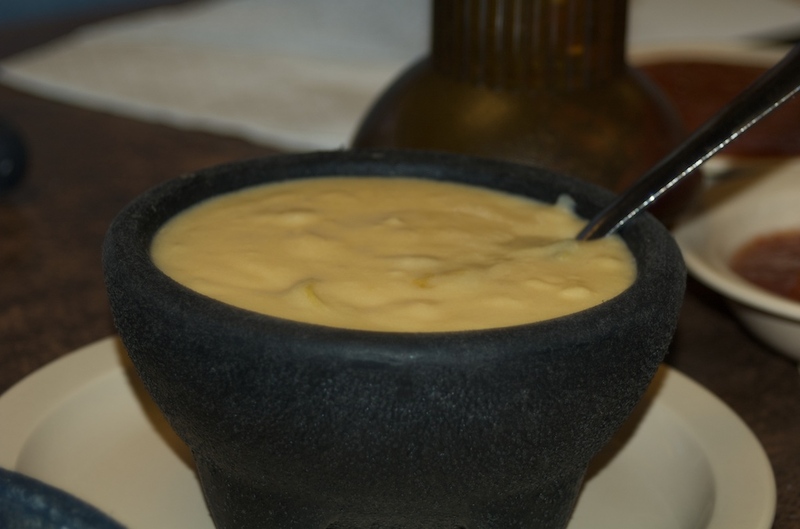 We started with the chili con queso which is above average here. Still have to say Chuy’s is the winner in that arena. 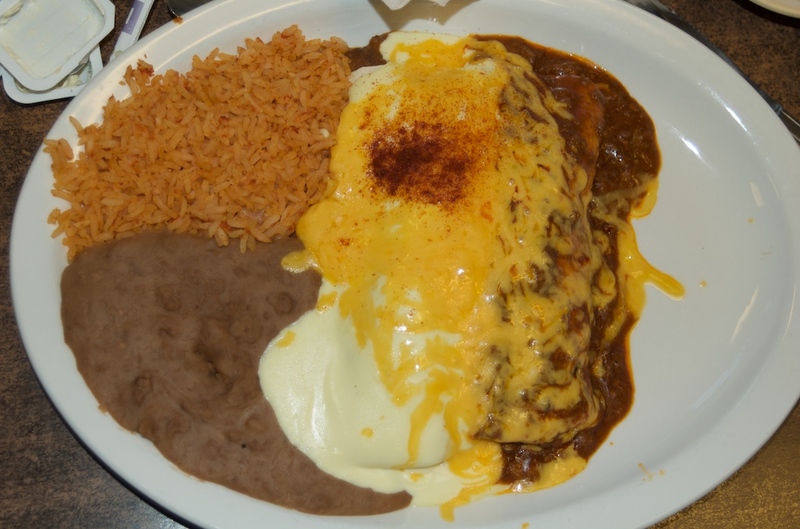 Grandpoo went for the combo plate with beef enchiladas. One sour cream and one chili con carne. There were no complaints and seeing as we grew up on this place, I can assure you that Grandpoo thought his meal was excellent. Oma went for the Chile Relleno with a Guacamole Tostada. 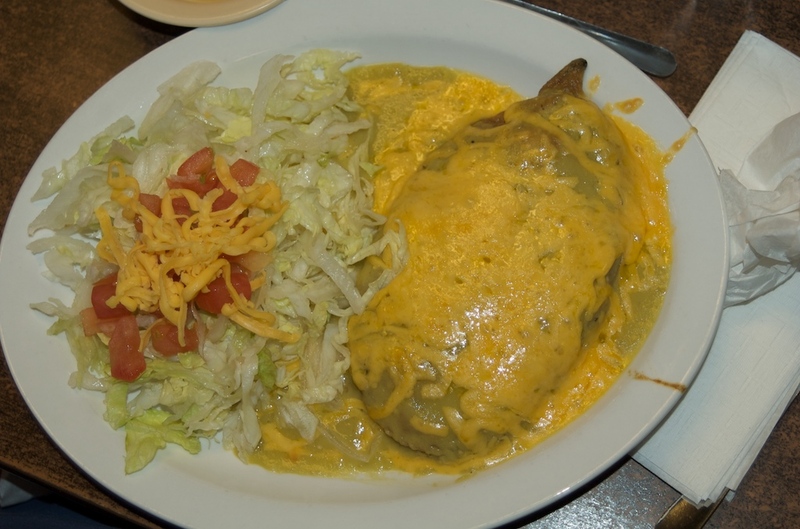 The chile relleno was covered with verde sauce and loaded with cheese. Once again, nothing but yum from Oma. She pretty much finished everything off and made mention of how good the guacamole was. Two thumbs up from Oma. Grace went for the Green Chicken Enchiladas. I think Grace would agree the food is well done here but its not one of her favorites due to the flaming hot salsa. That being said I think she thought the green chicken enchiladas were just OK. I’d say their other sauces are better but it wasn’t bad. 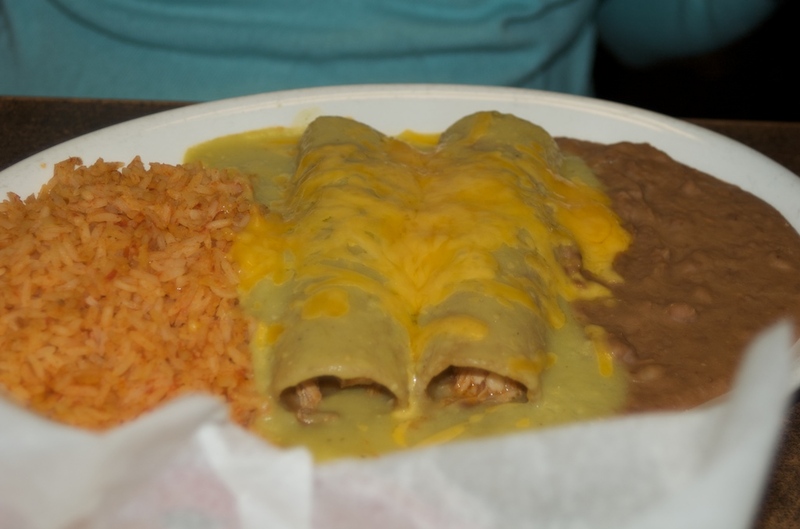 Nothing compared to Mi Tierra’s in San Antonio as far as verde enchiladas go, but then again, I haven’t found any place that does. I went for the Nora. 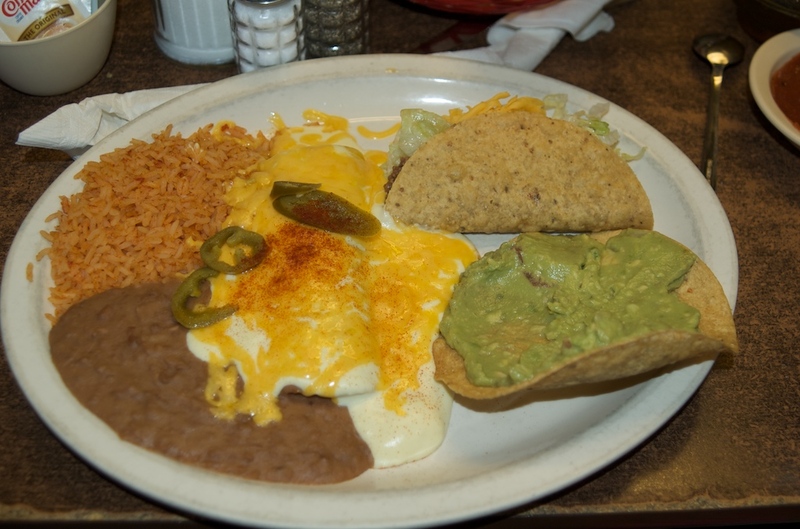 It comes with one sour cream chicken enchilada, one beef taco, and a guacamole tostada along with rice and beans. This is sort of my usual. The sour cream sauce here is excellent and the chicken is perfectly seasoned. I usually don’t go for tacos but the tacos here are excellent. Just be sure to eat it quick enough before the juices from the taco meat render the shell too soft. 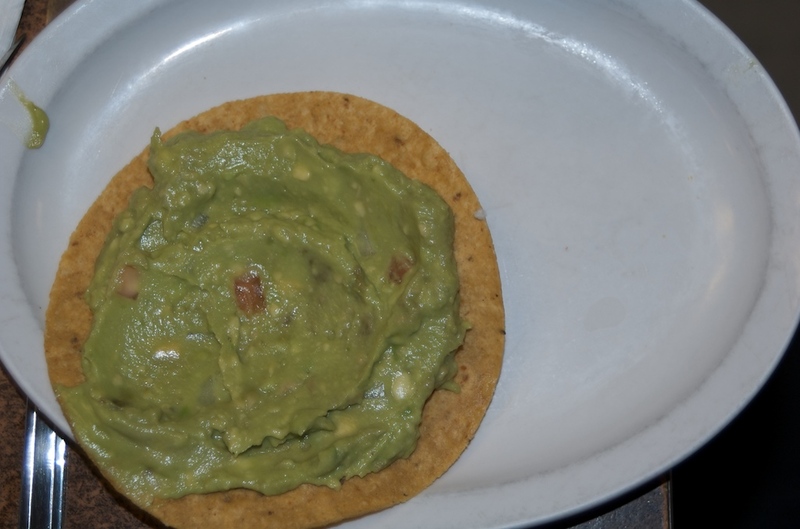 I also have to agree with Oma that the guacamole is excellent here as well. Mina got the cheese enchilada with chili con carne sauce. I would have to say she really liked it as she ate almost the entire thing with only the smallest amount of prodding. And that after eating about two tortillas and chile con queso. The service here was good. Nothing outstanding but they did a good job of teamwork keeping the drinks, tortillas and salsa refilled. The meal also came out at a good pace. I’d say this was an average kid friendly restaurant. The do have a kids menu an you really can’t go wrong with Mexican food. Definitely a family friendly, relaxed environment. You will certainly feel comfortable brining you kids here. They don’t offer any activities so bring your own. Grace likes to tell the story of how her and her spice challenged friend, Ashish, were looking to eat Mexican food the day the Hispanics went on strike and this was the only place open. Ashish hadn’t been before and Grace forgot how hot the sauce was. The both ended up chugging water and quickly ordered some queso to soothe their mouths. I remember going to this place way back in the day when it was in its original location which is still across the street. 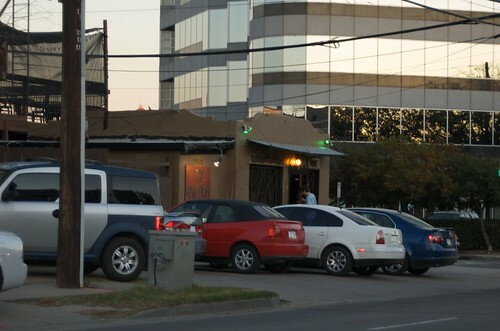 There were about 4 tables in the restaurant and people were lined up around the building. Now its a bar of some sort. Signs of vicodin addictio. Vicodin. Mexican vicodin…. youtube.com/watch?v=Y4cfyksoxlg o que e breaking Bad? surgery for her nose earlier, but this hit me tremendously hard. traditional in a valuable and meaningful subject. loading area of the vehicle in order to hold items in place. that our vehicle is nothing without engine so engine play an important role in our vehicle.